Roy Harper is probably the least defined member of Arrow's cast of characters at present. Small wonder given that he came into the show over halfway through the first season and most of his character arc has involved him pushing Thea away and reluctantly hinting at a troubled past he wants to put behind him. Arrow #33's story, Potential, strips away some of this mystery as it tells a tale of Roy Harper's life three years earlier. 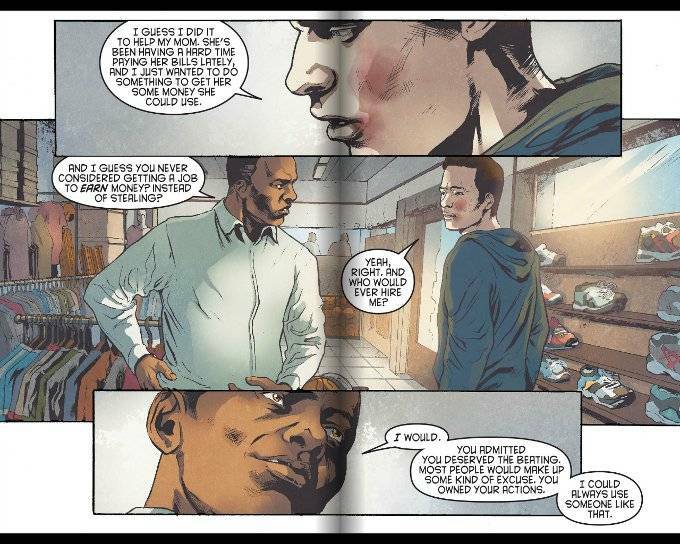 The story by Marc Guggenheim with script by Drew Z. Greenberg centers upon Roy shortly after he gets his first job. Ironically, the job at a sporting goods store is presented to him after he is honest about why he was fighting in the alley behind the store and having turned to car theft to take care of his cash-shy mom. Complications arise when another thief Roy knows wants to take advantage of Roy's new position, despite Roy's objections that his new boss doesn't deserve such treatment. The script does a good job of laying out Roy's internal conflict. This story explains why Roy has been so resistant to Thea's attempts to make him change for the better up until his life was saved by The Hood. 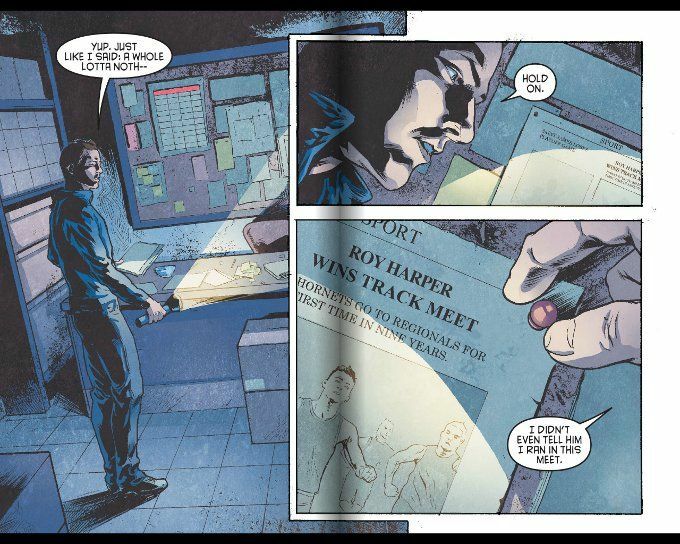 It also lays out some more references to the Roy Harper of the original Green Arrow comics, such as a newspaper clipping about Roy's exploits as a Track and Field star. Roy is speedy. Get it? Xermanico's artwork proves the equal of the script. Everything is atmospherically shaded and inked in a fantastic way, particularly the night scenes when Roy breaks into his new place of employment. My only real complaint about the artwork is that some of the coloring is a bit off, with some panels after the alley fight appearing as if Roy overdid it on the rouge rather than being heavily bruised. Bottom Line: This comic is a must-read for all fans of Arrow and the Roy Harper character. It's a bargain at 99 cents to download. Good story. Good art. Highly recommended.